The holiday season is quickly approaching. Be the best-dressed elf at every holiday gathering with these amazing homemade earrings adorning your ears. Count down the days until Christmas, or create a special pair of earrings for each day of the month of December with this collection of holiday earrings. The right pair of earrings can be the perfect final touch for any holiday outfit. 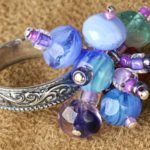 That is why we at AllFreeJewelryMaking have compiled a collection of earrings to match with the season, so that you can find the pair you need for any occasion with this list of how to Make Ornaments for Your Ears: 31 DIY Christmas Earrings. 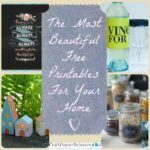 There are so many options in this collection that you can make DIY Christmas gifts for all of your friends and family. 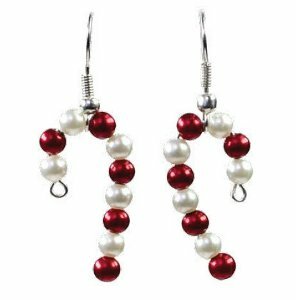 No matter who these stylish sets are for, these homemade Christmas earrings are sure to bring a lot of festive and fashionable fun to the holiday season! 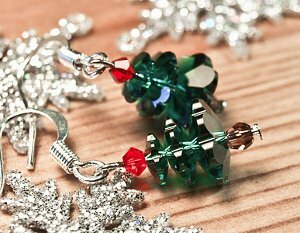 Christmas trees are a favorite holiday motif, and they also make adorable earrings. These Cute Christmas Tree Earrings are sure to be a favorite pair for you to wear all season. From beading to wirework, find the Christmas tree earring pattern that best suits your style for the holidays. Let it snow, let it snow! You’ll be singing that classic tune when you check out these stunning earrings inspired by snow and snowflakes. Make bead earrings that shimmer and sparkle like freshly fallen snow with this pattern for Beautiful Beaded Snowflake Earrings. 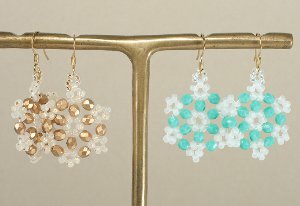 Create a winter wonderland with these snow and snowflake-themed earring projects. If you want to make earrings that proclaim your love of Christmas, you can’t go wrong with this set of Heavenly Host Earrings. Show your joy for the true reason for the season with these angelic earring patterns. 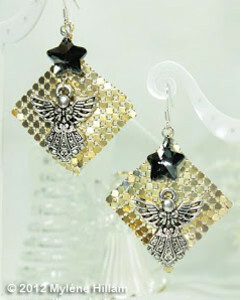 Plus, add a little sparkle to any outfit with some excellent star-themed earring sets. 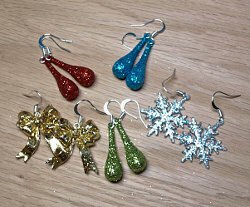 ‘Tis the season to be jolly and deck your halls, and now you can also deck yourself out with these festive Christmas earrings. Plus, these gorgeous DIY decorations for your ears like these Super Simple Ornament Earrings couldn’t be more perfect for a last-minute gift idea or a stocking stuffer. Ring-a-ling, hear them ring! 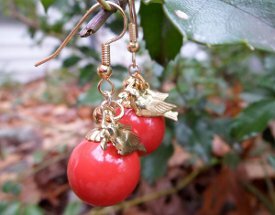 Make earrings that will remind you that it will soon be Christmas day! DIY Christmas crafts don’t get much more festive and elegant than these Jingle Bell Wreath Earrings. 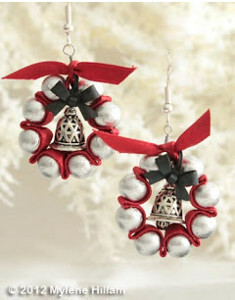 Find these and more earrings featuring holiday bells in this Christmas earring collection. Bring the colors of Christmas into your accessories with these peppermint-inspired patterns. These Quickie Candy Earrings and other candy-cane-inspired earrings are sure to be a sweet jewelry treat for the holiday season. Find even more jewelry pieces to complete your holiday collection with these Christmas earring patterns! Looking for holiday jewelry inspiration beyond earring sets? 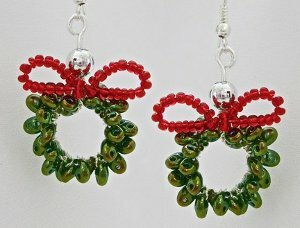 Check out AllFreeJewelryMaking’s extensive list of Holly Jolly Jewelry Patterns for Christmas! What is your favorite piece of holiday jewelry? You’ve Been Gifted: 7 Holiday Rainbow Loom Patterns + AllFreeKidsCrafts Giveaway! Two things are on everyone’s minds right now: Christmas (of course!) and Rainbow Looms, the latest jewelry craze. Whether you’re already obsessed or you’re just starting out, it’s time to put your Rainbow Loom love towards some holiday projects! AllFreeKidsCrafts has searched high and low for the best Rainbow Loom patterns for the holidays, and now you can follow these video tutorials to learn how to make Rainbow Loom designs for Christmas! Who knew Rainbow Looms could be used to make more than jewelry? These Rainbow Loom patterns would make great homemade gifts for friends and family, but Santa will understand if you gift some of these Rainbow Loom projects to yourself. And speaking of gifts….AllFreeKidsCrafts has something else for you! Scroll down to find out how to win a copy of Totally Awesome Rubber Band Jewelry! If you want to start creating Rainbow Loom designs for the holidays but haven’t spent much time with a loom, start with this Holiday Rainbow Loom Bracelet. By the time you’re finished with this Rainbow Loom bracelet you’ll have a simple accessory to wear to every holiday party, and you’ll be ready to tackle the rest of these festive Rainbow Loom patterns! This precious charm is super sweet! You could make these tiny candy canes to use on your Rainbow Loom bracelets as charms, or string them up as itty-bitty decorations. O Christmas Tree, O Christmas Tree…who knew you were made of rubber bands? This Rainbow Loom design would make a great homemade Christmas ornament! If you want to make a snowman but there’s no snow on the ground, never fear! Frosty’s here! This Rainbow Loom pattern makes a great wintry accessory. You’ll need 2 looms to make this Rainbow Loom bracelet, but don’t let that turn you into a Grinch! You’ll love this fun Rainbow Loom pattern, and so will the friend that shares his or her loom with you to help you make it. Let it snow! No two snowflakes are alike, so feel free to use lots of holiday colors on this Rainbow Loom pattern. This Rainbow Loom design requires two looms, so invite a friend to come over and make the Snowflake Charm with you! Getting on the nice list is easy this year…just make this Santa Rainbow Loom pattern! All of Santa’s elves will be so impressed that you recreated Santa himself with colorful rubber bands. If you love these videos, make sure you check out the Rainbow Loom video tutorials on AllFreeKidsCrafts! 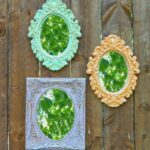 WIN A PRIZE FROM AllFreeKidsCrafts! The Rainbow Loom is quickly taking over craft stores and climbing the ranks of trendy toys for kids, so there’s no time to lose. If you want to get in on the latest craze, Totally Awesome Rubber Band Jewelry will help you get started. This book is a complete how-to guide for using this popular crafting craze, featuring unique designs that will wow your friends. 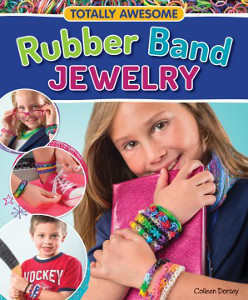 Enter to win the Totally Awesome Rubber Band Jewelry Book Giveaway today! We are giving away one (1) copy of the book to one (1) winner. The deadline to enter is December 2, 2013, at 11:59:59 p.m. Eastern Time. Click here to enter for your chance to win! Which one of these adorable holiday Rainbow Loom patterns do you want to try? Join host Tiffany Windsor for a new episode of Cool2Craft TV. This week’s show theme is Holiday Happenings. EcoHeidi Borchers is creating a paper doily angel – perfect for your tree or tabletop display, Candace Jedrowicz is crafting a jingle holiday barrette and Tiffany is reverse painting a glass holiday plate with Christmas ball theme. It’s easy to watch the Cool2Craft TV Channel right from your computer. Monday November 14, 2011 at 9 am Pacific/ 10 am Mountain/ 11 am Central/ noon Eastern. Watch craft demos and join in the live chat at showtime at Cool2Craft.com. See you Monday! The Secret to Easy Holiday Crafting: Watch and Learn! For me, crafting is sort of like shopping. The idea of going to the mall and taking my clothes on and off and trying to figure out what looks good and what doesn’t is just so… exhausting. But I also love clothes and want to keep my closet stocked with cute shirts and nice jeans. So shopping is something that I look forward to and dread at the same time. That’s why I always go shopping with a friend. Not only is it great to have company and someone to commiserate with when pair after pair of jeans just won’t fit, it’s also a great motivation to actually GO shopping. My friend Alyssa calls me and says “we’re going shopping” and, as much as I don’t want to, I go. And guess what? I end up having a good time. I’m the same way with crafting. It’s something I want to do and I always love the finished product, but the actual process, especially the whole “getting started” thing is a little bit intimidating for me. I never quite know if I have the right materials, if I’m doing the steps right, if my project is looking how it’s supposed to at each stage of the process and a whole host of other concerns. That’s why it was such a huge moment for me when I first discovered craft tutorials on YouTube. I guess I had never thought about it before, but once I found one, I was hooked. Click after click after click, I just kept finding more awesome videos that actually SHOWED you how to make things. And the people giving the instructions were so nice and friendly. It was sort of like I had a whole new bunch of crafting buddies, except I had never met any of them before! Since I live by myself and usually am a solitary crafter, it was really nice to have some company while I made my projects! With the holidays just around the corner, you’re probably planning a bunch of DIY projects. If you’re like me and would rather follow along with someone as they make something instead of just reading a list of steps, you’ll appreciate the collection of videos on the AllFreeHolidayCrafts YouTube channel. 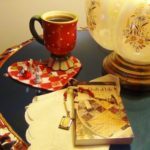 There are tons of great ideas for the upcoming holiday season, including a Christmas Card Gift Set and instructions to make Easy Poinsettia Flowers to decorate for Christmas. There are also some fun seasonal projects on the channel. 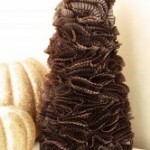 My favorites are the Fall Blocks Tutorial and the Winter Wreath Tutorial. Check out a couple of the videos below and then be sure to subscribe to the channel (it’s the little yellow “Subscribe” button on the left of the screen). That way you’ll know whenever a new craft video is posted! Tell us: What kinds of videos would you like to see on the AllFreeHolidayCrafts YouTube channel? We’re taking suggestions! 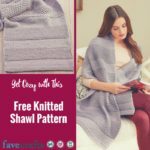 FaveCrafts Celebrates World Card Making Day! Happy World Card Making Day! Here at FaveCrafts, we couldn’t contain our excitement for the exciting holiday (well, it’s a holiday to us). During a meeting earlier this month, our team decided to celebrate World Card Making Day by hosting an office card swap! Each person picked the name of a fellow editor out of a bowl. All card swap participants were tasked with making a homemade card. It could be as creative or innovative as they wanted it to be . Basically, there were no specifics when it came to the cards – the more creative the craft, the better. On the day of the swap, we each presented our homemade cards, Secret Santa-style. 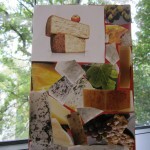 FaveDiets editor Matt made AllFreeSewing editor Kirsten a cheese-themed collage card. This is a great way to recycle old magazines and pamphlets. 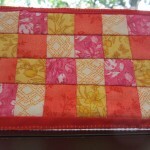 FaveQuilts editor Jessica made a quilted card for Blair, editor of AllFreeSlowCookerRecipes, AllFreeChickenCasseroleRecipes and AllFreeCopycatRecipes. Think outside the box when creating a card – use fabric and other materials you wouldn’t “normally” choose. 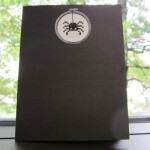 Simone, director of social media, created a needlepoint spider for her card for AllFreeHolidayCrafts editor Rachel. Yes, you read right. She actually used needlepoint for her card! Such a cool way to mix up craft styles to create a unique project. AllFreeSewing editor Kirsten made a card for AllFreeBeadedJewelry editor (and daily driver) Maggie. Cards can fit any occasion, not just birthdays or the holidays. A homemade card is a quick, easy and heartfelt way to say you care. AllFreeKnitting editor Caitlin created this cute owl card for me! 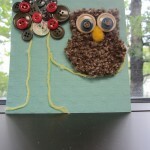 She actually knitted the body of the owl and used glue to add buttons and yarn to the card stock! 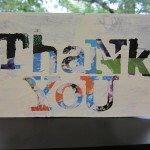 This card has so many pretty colors and textures – I love displaying it on my desk! How are you celebrating World Card Making Day? Physics, particularly the advances in quantum physics seen in the later part of the 20th century, tell us that time is an illusion: particles can interact forward or backwards in time, or even interfere with themselves. However, taking all this too seriously will inevitably lead to missing appointments, trains, and meals. It’s good to keep your mind on the present, especially when dealing with crafts that involve sharp objects. We went on Facebook to ask our readers what was keeping them busy in the here-and-now, and today we share some of our favorite responses. And some are thinking even further ahead than that, like Fabrizio Martelluci, who clearly doesn’t share my family’s longtime tradition of rushing to send out cards on December 24. Kami Randall Mullens, below, has more domestic things on her mind, and she was kind enough to share a photo! Reprinted for your convenience, here’s Kami’s excellent skirt! Looks a little like a monster from Super Mario Brothers, I think: be careful about letting that baby near pipes, Venus flytraps, or fireballs. 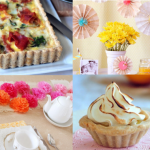 What do you think of our readers’ crafts? What are YOU working on right now? Christmas may be 10 months away, but with AllFreeChristmasCrafts‘ newsletter, Crafty Christmas Ideas, you can get in celebrate all year long. With over 500 links to fantastic projects, you’ll never be bored. Start planning for the holiday season now and reduce stress and gift-giving anxiety! Our first newsletter comes out next week, sign up now. 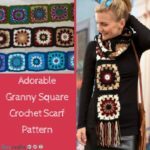 From crochet patterns to paper crafts, beaded ornaments to kids’ wearables, this newsletter has it all. 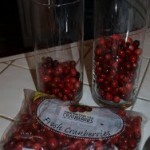 Cranberry Vases – Looks great all year round! 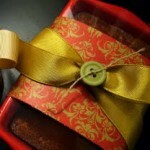 Easy Pumpkin Bread Wrapper – Perfect for anyone that likes to give baked goods. Cupcake Liner Flower Tree – A sustainable craft that’s cheap and easy. 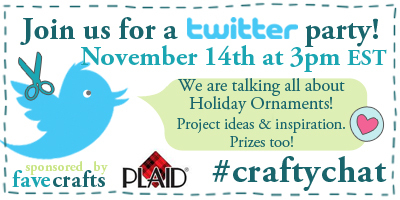 This is a great opportunity to get crafty and celebrate the most wonderful time of the year any day you want! Sign up now for this weekly newsletter and find the perfect Christmas craft project. 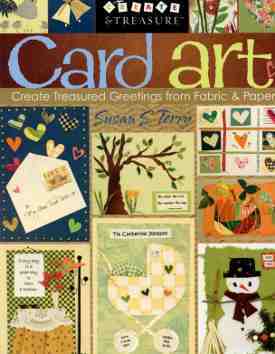 The Card Art book includes over 50 homemade card projects for seasons, special occasions, holidays and more. 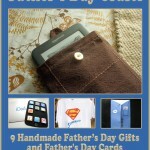 Best of all, this book tells you how to create homemade cards with fabric in additon to paper. Fabric cards are definitely unique and most of these mail just fine. We are giving a copy of Card Art by Susan S. Terry to one lucky winner. Read the full review and enter to win here! Contest ends November 23, 2010. You can enter once daily, so return often to improve your chances of winning!